a fuel air meter uses a o2 sensor, if you place it in the header collector it gives an AVERAGE of all the cylinders on that cylinder head,If theres an (X) installed close to the dual collectors reversion pulses can occasionally even give data from the other side of the engine, so in theory and in practice you can have two cylinders run lean and two rich and the AVERAGE tends to look RICH to the O2 sensor as it SEES unburnt fuel, if you place it in the individual primary header tubes you either need eight O2 sensors (VERY EXPENSIVE, and keeping the wires from burning or grounding outs a TOTAL P.I.T.A......IF you don,t succeed you destroy the O2 sensor and need to replace it.) 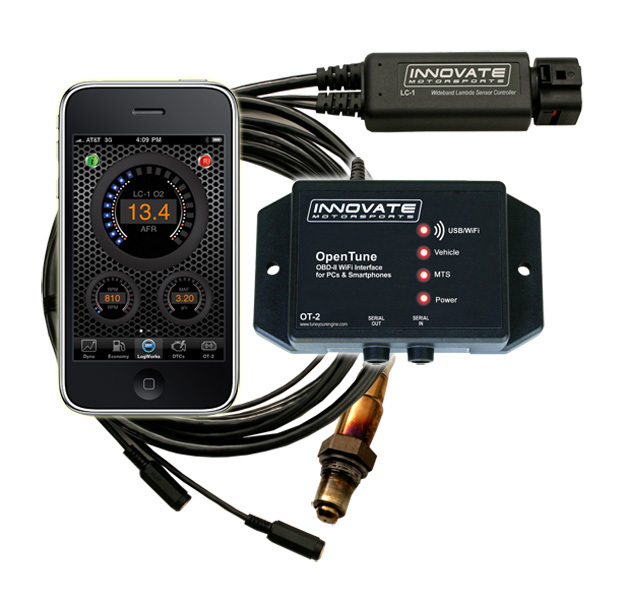 or you need to be constantly swapping very hot and fragile O2 sensors and bung plugs constantly, but with the IR thermometer you can almost instantly see which cylinders are running hotter or cooler and adjust the jets or look for vacuum leaks, or other CAUSED for the TEMP DIFFERANCE, ETC, far faster too get all the cylinders running at approximately the same temp, indicating the same fuel air ratio, youll be amazed at how close the temp follows the fuel/air ratio, and you can confirm it with plug condition and the other test equipment. run any cylinder too lean and detonation can break rings or melt pistons, run it too rich and you can wash the oil off the cylinder walls and ruin rings/scuff pistons, you need to know whats going on in EACH CYLINDER not the AVERAGE of all cylinders. "Exhaust gas temperature (EGT) depends on combustion temperatures. The hotter the mixture burns inside the cylinder, the hotter it will be coming out. Theoretically, combustion temperatures are at a maximum at stoichiometric, but realistically the maximum occurs slightly rich from peak because of the dissociation of Oxygen from the combustion products (CO2, H2O). Why temperature drops when rich or lean is described by the energy released caused by the chemical reactions between the fuel and air. Too little fuel (lean) and there is less energy contained within and more heat is transferred to the cylinder walls (no fuel evaporation or boundary layer), thus the lower temperature when it burns. Too much fuel, and combustion efficiency drops thus generating less heat. I know, this is not too detailed, but it gets the point across without involving too much technical jargon. Of course, this all assumes MBT timing and stable combustion. You can also change exhaust temps by varying spark timing, arguably more so than by just varying AFR. EGT is increased when spark timing is retarded since you are giving the gasses in the cylinder less time to cool off before the exhaust valve opens. " AND WHILE A A/F GAUGE IS A GREAT ASSET, ITS EASY TO DAMAGE, AND ITS BEST INSTALLED IN YOUR CAR , NOT USED AS A SHOP TOOL. I picked this up some time ago but pulled it out because I was told by a local leaving it in for daily use might damage it. Yeah, thats because with the engine running the snesor has to be powered/hot. Also, its best to start the unit/heat the sensor just after the engine start, you dont want to cause moisture blast on the hot/heated sensor while the engine is first starting. 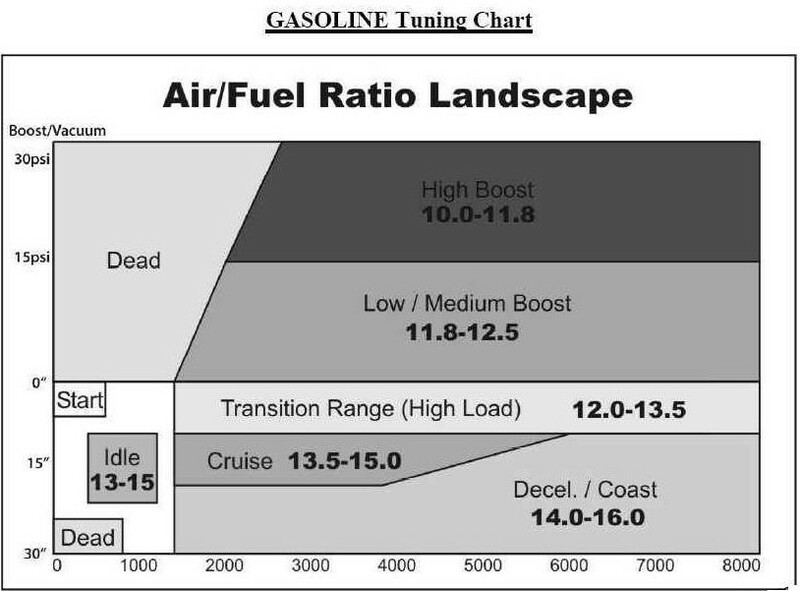 Here is what I use, and I tune for 10.5 at WOT with 24lbs of boost spraying straight meth on top my regular 94 octane fuel. Its a safe tune some guys will lean it out a bit but I like safe at 24 PSI. I may try to make a TPS (potentiometer/resistor forming a voltage divider)using one of the input of the LM-2. So far i could try only the OBD-II functions on a newer car, will try it completly next season(april 2k12 is where i plan to take the car out). 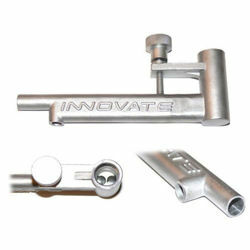 How important is it to be capable of monitoring both sides of a V8 with a single 4-barrel on a dual plane manifold ??? Certainly one is better than nothing, but seems like you are only getting half the picture with one side. Love the idea of data logging, much easier to look over the data when you are NOT driving. Whats has been your experience, any problems with just one sensor ??? while dual sensors is obviously close to ideal and having a dedicated sensor for each cylinder is ideal, Ive swapped sides on the sensors testing my corvettes engine in the past and had very similar results so I doubt its going to be a problem. grumpyvette wrote: while dual sensors is obviously close to ideal and having a dedicated sensor for each cylinder is ideal, Ive swapped sides on the sensors testing my corvettes engine in the past and had very similar results so I doubt its going to be a problem. Thats good to hear and you can also make an average of both side reading and in some case you can configure the unit with this in mind, so while you have just one sensor it will display a reading that average both side together. I did go the single channel route, but the unit is capable of dual channel so hopefully if i buy one more sensor it will work on dual channel . mathd wrote: I did go the single channel route, but the unit is capable of dual channel so hopefully if i buy one more sensor it will work on dual channel . SWEET, twice as many numbers......I wonder what I could do with this and an Excel spreadsheet. I'm starting to get a ???? as I type on the keyboard now! Indycars wrote: SWEET, twice as many numbers......I wonder what I could do with this and an Excel spreadsheet. I'm starting to get a ???? as I type on the keyboard now! My issue is the instructions on the water/meth say to tune first the carb for slightly lean. (!!!) Say 12:1. Then use the water/meth to tune and hit 11:1 as your target. THAT seems like a scary way to tune. I probably will take out ignition timing thru boost retard... reach 12:1 with carb only... add water/meth to reach 11:1... then experiment with pulling out boost retard. Personally I do it oppositely start with a fat tune and pull fuel or add boost or timing until the knock sensor says I've gone to far than dial it back a bit little safer IMO. With water in the mix 11.0 isn't a bad target just watch the knock gauge. I would probably tune using the Lambda instead of the A/F reading since your blend of gasoline and alchool. 1.0. 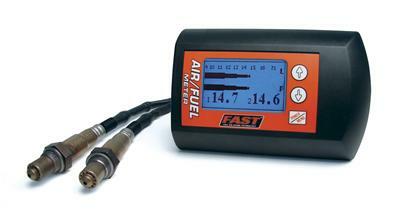 If you set it to 6.4 (methanol) the LM-2 will show 6.4 AFR for Lambda 1.0.